In a video making the internet rounds lately, the Atlantic White Shark Conservancy has captured video of a seal off the coast of Cape Cod that narrowly avoids becoming dinner for an attacking great white shark. 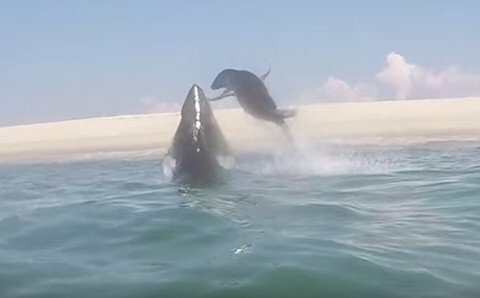 In the 26 second clip posted to Youtube, the great white and seal have two aerial close encounters just a few yards from shore, providing yet more evidence why it’s so important to be aware when swimming in the ocean and especially around seals. The area off Cape Code has been the subject of increased shark attacks in recent weeks with one great white taking a seal recently near a popular swimming beach. Other recent shark attacks this year have occurred in North Carolina, Florida and South Africa.